Major League Baseball has changed the way it is approaching Memorial Day uniforms for 2019, heeding criticism from the past and hoping to strike a subdued tone that’s more in line with the true meaning of the holiday. Neither the Memorial Day jerseys or the caps will be sold at retail stores, another change in MLB’s approach. The camo uniforms fans are used to seeing on Memorial Day will instead be worn May 17-19. The league is shifting that look to Armed Forces Day, the annual holiday that celebrates the military and falls on May 18 this year. The difference between the two holidays is important: Armed Forces Day is about celebrating the military and its members, while Memorial Day is a solemn occasion to mourn soldiers who died in combat. MLB is unveiling all of its holiday uniforms Friday, showing what players will wear for Mother’s Day, Father’s Day, Fourth of July and so on. None of them, however, have been as polarizing over the years as Memorial Day. While the camouflage hats are popular sellers at retail, the league has faced criticism for its approach to the holiday because the tone was often seen as too celebratory and not in line with the true idea behind Memorial Day. In 2017, four Detroit Tigers players wore poppies on their own for Memorial Day, proving they were ahead of the curve on this year’s change. Some fans and media members (heck, even a player) didn’t like that MLB would sell its Memorial Day caps and jerseys, even though proceeds from the uniform royalties were given to veteran-minded charities. That donation has been a minimum of $500,000 in the past, regardless of sales. In 2018, the money went to the Tragedy Assistance Program for Survivors and Folds of Honor Foundation. Getting this right is particularly important to LeGrande, who comes from a military family. Her father served in U.S. Army’s Military Police Corps for more than 20 years and mother worked in transition assistance for the Army and Air Force. Her sister also served. 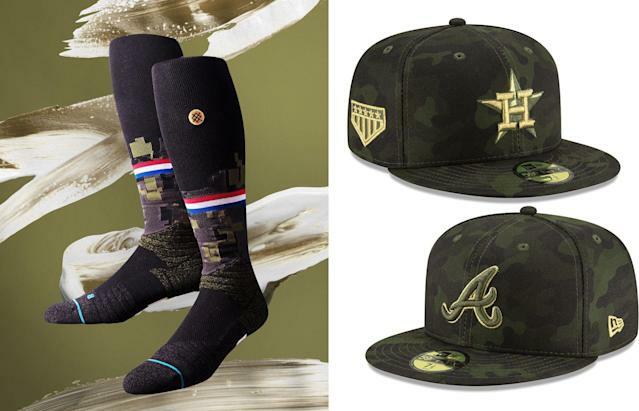 For Armed Forces Day, teams will wear camouflage-tinged jerseys, camo caps and special socks. The caps will feature a five-star emblem to represent the five branches of the U.S. military. Those will be at sold at retail, with 100 percent of uniform royalties going to charities. 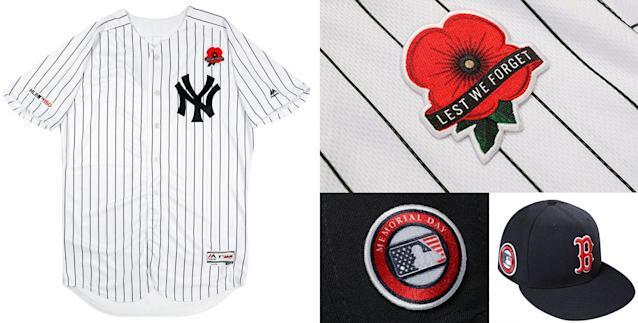 For Memorial Day, beyond the poppies and cap patches, teams will wear their usual uniforms. What won’t change for Memorial Day is the individual team’s on-field tributes featuring their own local military heroes. That includes first pitches and on-field presentations. The jersey-sales often proved to be a sticky point for the league, because even though it was donating large sums of money to charities (and also does so for its other holiday uniforms like Mother’s Day and Father’s Day), the reaction from some fans was often that MLB was trying to profit off these holidays. “We don’t want people to feel that way. We don’t want to earn revenue on things that are supposed to honor those that we lost,” LeGrande said, adding that the league hopes the Armed Forces Day uniforms will provide a more clear avenue for holiday jerseys, the sale of them and the charitable contributions.